If you've ever struggled to use chopsticks in a Chinese restaurant, or wondered why everyone doesn't just use knives and forks, then this is for you! Chopsticks, in their first incarnation, were used in China some 5,000 years ago when people used twigs to take food out of the large pot in which it would be cooking. Cutting food into small pieces before cooking - thus speeding up the cooking time and saving fuel - eliminated the need for knives while eating, as the twigs that were used during cooking could be used for eating with as well. In the 5th century BC Confucius, the Chinese philosopher and scholar, declared that 'the honourable and upright man … allows no knives on his table.' As the number of followers of non-violent Confucianism grew, so the use of chopsticks spread throughout China and by 200 AD chopsticks were the primary utensil. From there chopsticks spread throughout Asia, into Japan, Korea and Vietnam. Chinese chopsticks are typically made from bamboo. Bamboo grows freely across the country, and its resistance to heat makes it an attractive choice. Wood and bone have also been used while the wealthy may choose precious metals for their eating utensils. Silver was a popular choice for the rich at one time as it was thought that should the food be poisoned, intentionally or otherwise, silver chopsticks would go black. This has now been shown to be untrue although the hydrogen sulphide released from rotten eggs might cause a discolouration of silver chopsticks. Some chopsticks are highly and artistically decorated with calligraphy or elaborately carved. You'll find chopsticks in other parts of the Asian continent but these are the most familiar. Chinese chopsticks are known as Kuai-Zi or 'quick little fellows'! They are usually about 10" long with blunt ends. Japanese chopsticks are typically smaller, about 7-8" long, and taper to a point. 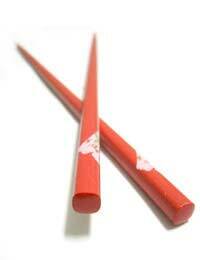 Originally chopsticks in Japan were used for religious ceremonies rather than everyday eating. Most of the rules of dining etiquette and good manners apply equally when eating with chopsticks but there are some specific rules as well. These may vary in different parts of Asia so if you're visiting a country, our advice is to watch and respect how others behave. Hold your chopsticks near the top rather than the middle or bottom. In between mouthfuls or when you've finished, lie your chopsticks down on the chopstick rest that will be provided in restaurants. It is traditional to lay them with the tips pointing slightly to the left. Don't spear your food. Most especially don't spear rice as this has connotations of death rituals. Don't point at someone with your chopsticks or wave them around in the air. Use a serving spoon if you want to move food from a shared bowl into yours. If no spoons are provided use the 'other' end of your chopsticks i.e. not the end that's been in your mouth. Hold one chopstick at the base of our thumb next to your forefinger with two thirds of the chopstick pointing downwards. Support it with the end of your third (ring) finger. Hold the other chopstick like a pencil between your fore and middle finger. Your thumb can help hold it in place. If necessary, adjust the position of the upper chopstick so that the tips are together. Keeping the bottom chopstick still, swivel the upper chopstick using your thumb as the axis in a pincer movement. Hold the bowl close to your mouth. That way it's a shorter distance between your mouth and the food! Practise it! Using chopsticks is easy when you know how.